holding in its pincers for a meal on the go. As with cockroaches and a few other insects, Earwigs have been tarnished with a reputation that is more myth than fact. Some people have created the misconception that earwigs are so named because they like to crawl into people’s ears to do who-knows-what. Well, I’m here to tell you it’s just not true. They actually prefer to enter your head through your nose……Just kidding! 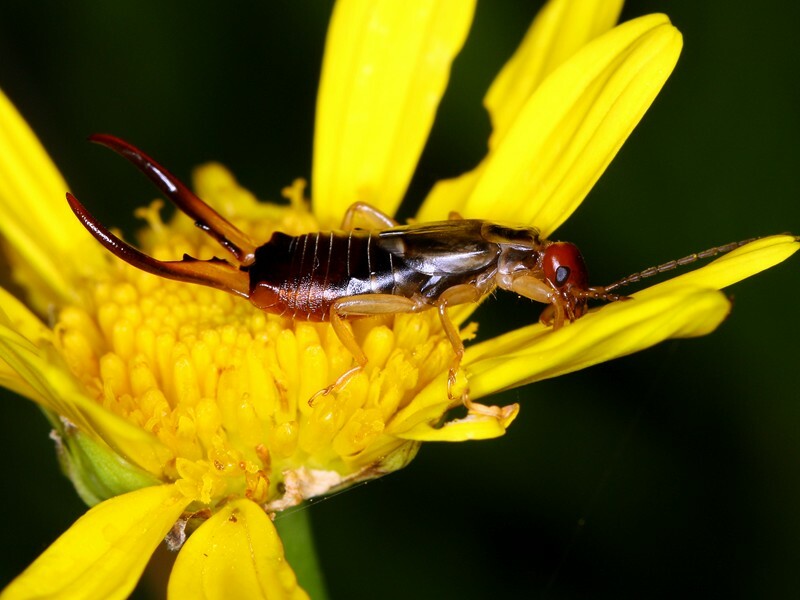 But seriously, despite being fairly common and widespread, earwigs prefer to remain out of sight and usually only enter homes because they are attracted by the lights. They prefer to remain out of sight and I have found very few of them during my searches. Earwigs range in size from 5 to 55 millimeters. They are easily recognised by the pair of pincer-like cerci attached to the end of their elongated abdomens. The cerci are used for holding prey, defence and perhaps gripping a partner during mating. All earwigs have three pairs of legs, a pair of usually well-developed compound eyes, and a pair of medium to long, slender antennae. Not all species have wings. If they do, the forewings are hardened and only cover the thorax. The soft hindwings are fan-like and are folded up under the forewings at rest. 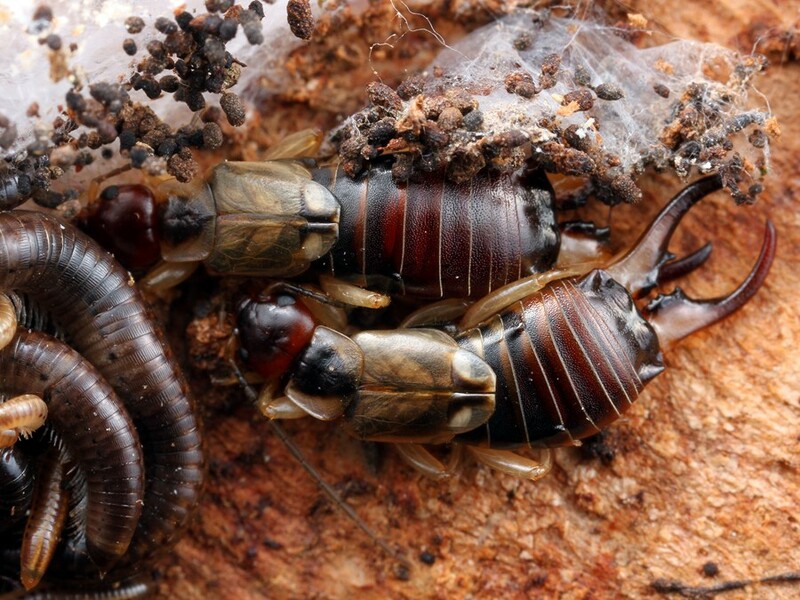 The life cycle of earwigs includes some unusual behaviour. After mating, the female lays 20-80 eggs in rotting vegetation, under logs or rocks, or in excevated brood chambers. Sometimes the male assists with the nest building, but he is given his marching orders when the female is ready to lay her eggs. The female protects and cleans the eggs during incubation, which will hatch after 2-3 weeks. The young basically look the same as adults and moult 4 or 5 five times before reaching maturity. In winged species, the wings are not fully developed until the final moult. The mother will stay with her young during the first couple of stages, protecting and feeding her brood. This maternalistic behaviour is unusual among non-social insects (bees and ants are examples of social insects). But the mother has been known to eat her young if they don’t leave the nest at the right time. Earwigs are generally omnivorous, feeding on plant matter and other invertebrates. One tiny species is known to parasitise bats. 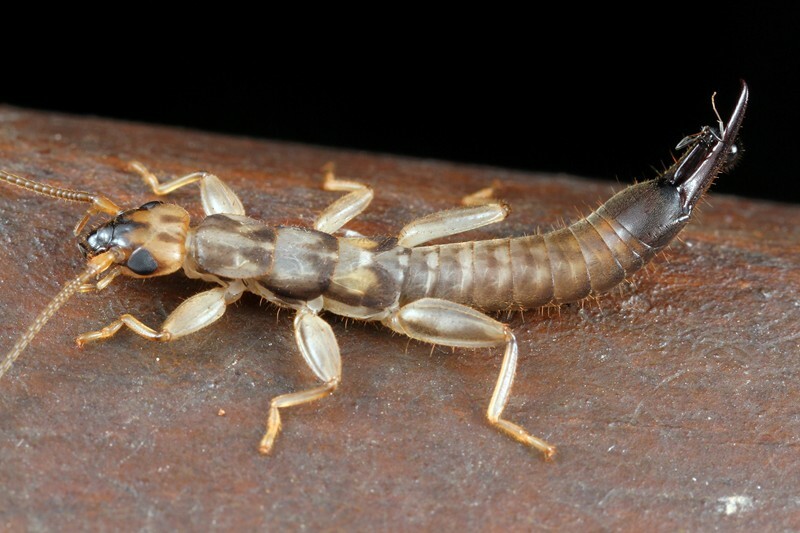 Most earwig species are found in the wetter parts of Australia, usually living under logs, rocks, in the soil and sometimes in the nests of ants and termites. In spite of what some people think, earwigs are not really pests. They can actually be quite beneficial by preying on other known pest insect species. A pair of earwigs, species unknown, found hiding under tree bark in southern Victoria.